Whale watching is the practice of observing whales and dolphins ( cetaceans) in their natural habitat. Whale watching is mostly a recreational activity (cf. birdwatching), but it can also serve scientific and/or educational purposes. A study prepared for International Fund for Animal Welfare in 2009 estimated that 13 million people went whale watching globally in 2008. Whale watching generates $2.1 billion per annum in tourism revenue worldwide, employing around 13,000 workers. The size and rapid growth of the industry has led to complex and continuing debates with the whaling industry about the best use of whales as a natural resource. The rapid growth of the number of whale watching trips and the size of vessel used to watch whales may affect whale behavior, migratory patterns and breeding cycles. There is now strong evidence that whale watching can significantly affect the biology and ecology of whales and dolphins. Do not coerce dolphins into bow-riding. In Uruguay, where whales can be watched from the beach, legislators have designated the country's territorial waters as a sanctuary for whales and dolphins. It is illegal to be less than 300 metres from a whale. In South Africa, the town of Hermanus is one of the world centers for whale watching. Between May and December southern right whales come so close to the Cape shoreline that visitors can watch whales from their hotels. The town employs a "whale crier" (cf town crier) to walk through the town announcing where whales have been seen. You can watch the whales in Hermanus from the cliff tops, from a boat or the air. Boat-based whale watching tours are available out of the Hermanus New harbour which allows the public to view southern right whales from June till Mid December. Port Elizabeth runs a boat-based whale watching tour out of the Port Elizabeth harbour which allows the public to view southern right whales from July to November, humpback whales from June to August and November to January, and Bryde's whales all year round, up-close. Visitors can also see humpback whales from the lighthouse at Cape Recife (the Westerly point of Algoa Bay), and southern right whales from viewing points along the coast. Boat-based whale watching (and dolphin watching) is also a popular tourist attraction in a number of other coastal towns in South Africa, such as Plettenberg Bay, where the industry is linked to conservation and education efforts through Plettenberg Bay-based volunteer marine conservation organisations. Plettenberg Bay is visited by southern right whales in the winter months and humpback whales in the summer months. Bryde's whales are resident throughout the year. The other famous centre for whale watching is False Bay. Tours leave Gordon's Bay and follow the coast around the bay. Species include southern right whales, humpback whales and Bryde's whales. Orcas are present during the winter months. Visitors include pilot whales and pygmy sperm whales. Many species of dolphin are encountered including Haveside dolphins. The same tours include great white sharks at Seal Island and the African Penguin Colony at Simon's Town. In Brazil, humpbacks are observed off Salvador in Bahia State and at the National Marine Park of Abrolhos during their breeding season in austral winter and spring. Likewise, southern right whales are observed from shore in Santa Catarina State and Espírito Santo during the same season. Mother/calf pairs can come as close to shore as 30 meters (about 100 feet). Income from whale watching bolsters coastal communities and has made the township of Imbituba, the Brazilian "whale capital". Tidal straits, inlets, lagoons, and varying water temperatures provide diverse habitats for multiple cetacean species. Substantial numbers live off the coasts of Great Britain, Ireland, Iceland, Scandinavia, Portugal, Spain, and France. Commercial car ferries crossing the Bay of Biscay from Britain and Ireland to Spain and France often pass by enormous blue whales and much smaller harbor porpoise. Land-based tours can often view these animals. Off the south coast of Ireland, humpback whales and fin whales are regularly seen on organized whale watching trips between July and February. Species seen all year include minke whales, orcas, harbour porpoises, and common, bottlenose, and Risso's dolphins. There is also a resident group of bottlenose dolphins in the Shannon Estuary which attracts tourists all year round. Chanonry Point is one of the best spots in the UK to view bottlenose dolphins. The dolphins are visible from the shore, particularly on an incoming tide when they play and fish in the strong currents. Other wildlife, including porpoises and grey seals, can also regularly be spotted. In Northern Norway ( Nordland and Troms) orcas are visible in the Vestfjorden, Tysfjorden, Ofotfjorden and Andfjorden as the herring gathers in the fjords to stay over the winter and off the Lofoten islands during the summer. At Andenes on Andøya in Vesterålen and around Krøttøya in Troms, sperm whales can be observed year round, summer whale watching trips occur from May till September, winter trips with killer whales and humpback whales are offered from October till April. Tromsø also offers whale watching for sperm and other whales. The continental shelf Eggakanten and deep water where the sperm whales congregate, is very close to shore, beginning only 7,000 meters (23,000 ft) from the Andenes harbour. 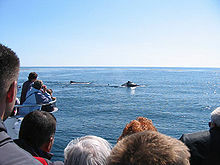 In Portugal whale watching is available in the Algarve. Lagos and Portimão are the most important whale-watching places. The species observed in this area are the fin, killer, and pilot whale, and the bottlenose, common, and striped dolphin. In the middle of the Northeast Atlantic, around the Madeira, the Azores and the Cape Verde archipelagos, whale watching is on the increase and popular due to more protection and education. One of the most common whales in these regions is the sperm whale, especially groups of calving females. In Spain whale watching is available along the Strait of Gibraltar, the Canary Islands, and in the Bay of Biscay. Tarifa is the most important whale watching town in the Strait of Gibraltar; this gateway to the Mediterranean Sea is also a central point in between the colder waters to the North and the tropical waters off of Africa: a good route for migrating cetaceans. The species observed in this area are the bottlenose, common, and striped dolphin, and the pilot, sperm, fin, and killer whale. In the Canary Islands it is possible to see these and others, such as the blue, beaked, false killer, and Bryde's whale, and the Atlantic spotted, rough-toothed, and Risso's dolphin. In Iceland it is possible to see whales in Eyjafjörður, Breiðafjörður, Skjálfandi and Faxaflói. The towns offering whale watching are Dalvík, Hauganes, Húsavík, Akureyri, Hólmavík, Grundarfjörður and Reykjavík. Most common are the minke, humpback, blue, killer, and sperm whale, as well as the white-beaked dolphin, and the harbour porpoise. A humpback breaching in the Stellwagen Bank National Marine Sanctuary. This is a behavior commonly seen in the area. In the past this area was the US whaling industry's capital, particularly Nantucket, an island just off the coast of Massachusetts. Though strict laws prohibit molestation of these large wild mammals, it is not unknown for the whales to approach whale watching boats uninvited, particularly curious calves and juveniles: it is not unknown in particular, for example, for juvenile humpbacks to approach the boat and spyhop to get a better look at the humans aboard. In recent years it is also not uncommon to see these animals playing and feeding in harbors, including New York City or Boston where fish species of interest to the whales have lately returned in astonishing numbers. As of 2011, an expert from Cornell University has recorded the vocalizations of six whale species including the humpback, the fin whale, and the massive blue whale within close proximity of the Verrazano-Narrows Bridge in the lower portion of New York Harbor and there is at least one company offering marine life tours out of The Rockaway Peninsula in Queens. Due to these increasingly frequent visits, new laws address the safety of boaters, commercial fishermen, and the whales themselves: off the coast of Boston, for example, cargo vessels must slow down to protect the much slower North Atlantic right whale and there is talk of erecting an apparatus for the much more heavily trafficked waters surrounding New York City that can warn boats of a whale's presence and location so as to avoid accidentally striking the animal. Because of the relative diversity of whales and dolphins within easy access of shore, cetacean research takes place at Woods Hole Oceanographic Institute, and the Riverhead Foundation among other centers. On the east coast of the United States, Virginia Beach, Virginia whale watching is a winter activity from the end of December until the middle of March. Fin, humpback, and right Whales are seen off the Virginia Beach coast on whale watching boat trips run by the Virginia Aquarium and Marine Science Center. Sightings are mostly of juveniles who stay near the mouth of the Chesapeake Bay where food is plentiful, while the adults continue to the Caribbean to mate. "Mom" and "Dad" pick up their offspring on the way back north where the whole family summers. The waters surrounding Virginia are also a known migration corridor for the endangered North Atlantic right whale: Pregnant females must pass through this area around December to reach their birthing grounds down the coast in Georgia and Florida. For these reasons the waters between the Delmarva Peninsula and the barrier islands that stretch southwards towards northern Florida must be monitored every winter and spring as mothers give birth to their calves, nurse them, and then ready themselves and their younglings to return north for the cooler waters near New England and Canada. About 25 species are observed in the Caribbean waters such as Humpback whales, Sperm whales, beaked whales and many other small cetaceans. Principle whale watch activities : Dominican Republic, East Caribbean islands. Caribwhale, the Caribbean whale watch association, include operators engaged in a sustainable whale watching activity, experts, conservationists and research groups as the International Fund for Animal Welfare, Dalhousie University and Association Evasion Tropicale. On the South and East Coasts of Sri Lanka and The Maldives, the industry is growing. During winter and summer, pygmy blue and sperm whales cross the southern tip of the island, migrating to the warmer waters of Southeast Asia. Many pygmy blue whales can be seen at Dondra point in Sri Lanka, accessed through the Mirissa or Weligama harbour. Whale-watching tours can be arranged in Sri Lanka. Blue whales and some types of dolphins can be seen in the sea of Mirissa in Sri Lanka. Many sightings have been reported from November to April. In the Pelagos Sanctuary for Mediterranean Marine Mammals, located in the waters of Italy, France and Monaco, there are eight species of marine mammals residents, most of them all year. Frequent summer excursions depart from the ports of Genoa and Imperia, in Liguria, Northern Italy. In Panama, the Pearl Islands archipelago receive an estimated 300 humpbacks whale from late June to late November. These had become now the main attraction for whale watching tours starting in Panama City. In the Gulf of Chiriqui, the World Heritage Site of Coiba Island National Park and the islands near the town of Boca Chica are offering opportunities for whale watching. Isla Iguana near Pedasi is now a popular destination for whale watchers. Several foundations train local community members to perform as guide and captains for whale watching tours. Watching orcas in Monterey Bay. Humpback whales watching (Megaptera novaeangliae), Juneau, Alaska, United States. On the Oregon Coast, several whale species, especially gray whales, may be seen year-round, and the state trains volunteers to assist tourists in the winter months, during whale migration season. In California, good whale-watching can be found year-round on the Southern California coast. During the winter and spring (December–May), gray whales can be seen from shore on their annual migration (the best spot being Point Vicente), while blue whales are often seen between July and October. Fin whales, minke whales, orcas, and various species of dolphins can be seen year-round. In spring, summer, and fall at the Farallon Islands off San Francisco, one may see humpbacks, grays, and blue whales. In Indonesia, whale sharks can be observed in Nabire of Papua region. Kaikoura in New Zealand is a world-famous whale-watching site. The sea around Kaikoura supports an abundance of sea life, with the town's income stemming largely from the tourism generated from whale watching and swimming with or around dolphins. Recently the sperm whale watching at Kaikoura has developed rapidly and now it is an industry leader, arguably the most developed in the world. The town went into recession after the collapse of whaling in New Zealand. Its recent development has been used to advocate the benefits of watching whales instead of hunting them. The Sunshine Coast and Hervey Bay (where the whales stay and rest before migrating) in Queensland, Australia offer reliable whale watching conditions for southern humpback whales from the end of June through to the end of November each year. Whale numbers and activity have increased markedly in recent years. [ when?] Sydney, Eden, Port Stephens, Narooma and Byron Bay in New South Wales are other popular hot spots for tours from May to November. Southern right whales are seen June–August along the south coast of Australia. They are often readily viewed from the coast around Encounter Bay near Victor Harbor and up to a hundred at a time may be seen from the cliff tops at the head of the Great Australian Bight near Yalata. See also Whaling in Australia. In Western Australia, whales are watched near Cape Naturaliste in the south-east Indian Ocean and at Cape Leeuwin where the Indian and Southern Oceans meet. In eastern Australia, whale watching occurs in many spots along the Pacific coast. From headlands, whales may often be seen making their migration south. At times, whales even make it into Sydney Harbour. Enjoyment of observing live cetaceans is rather separated from the domestic whaling industry in Norway; however, whale watching has become a popular national tourist attraction in recent years, especially in Andfjorden ( Vesterålen and Troms) and around Tromsø. Uniquely, public opinions against whaling showed sudden rises in 2014, when a possibly pregnant Minke Whale Heiko, named after Keiko the Orca and a local cetacean researcher Heike Vester who monitors the whale's safety, successfully shook off whaling vessels by taking refuge in the very shallow fjord of Lofoten, where large whales had not been seen for years; this has provided chances for locals to witness cetaceans at close range. Heiko's appearance soon resulted in an increase in interest among locals. As time passed, Heiko attracted more domestic and international interest, which has resulted in greater questioning and opposition to the whaling industry in Norway. There have been disputes and skirmishes between whale watching operators and whalers in the nation. For example, whaling was operated right in front of watching vessels, causing malaise among domestic and international passengers on board, and domestic disputes spread on the Internet in Nemuro Strait in 2007. Local tour operators confirmed that targeted species for hunting such as Baird's Beaked Whales and Dall's Porpoises are known to disappear or have become harder to approach in the seasons of whaling operations in the area. Recent notable declines and disappearances (or abandoning of historical habitats) of Minke and Baird's Beaked Whales in coastal waters caused by commercial and scientific whaling that have been operated in wide ranges off the eastern half of Honshu and Hokkaido especially off Abashiri, Gulf of Sendai, and along the coast of Chiba, caused dramatic decreases in sightings of both species in many areas, enough for whalers to be forced to change their operating ranges, and a watching operator in Muroran claimed that whaling affected the profits of the operator due to serious declines and low rates of successful minke sightings in the area. Hunting of Baird's Beaked Whales in Sea of Japan has ceased in recent decades, and the whales have been said to have become more friendly during this period; however, commercial whaling was resumed in Sea of Japan and caused concerns among cetacean conservationists. The first whale watching in Japan was conducted in Bonin Islands in 1998 by a group called "Geisharen 鯨者連" which was formed by groups of domestic and international people including both domestic and international celebrities and notable cetacean researchers and conservationists such as Roger Payne, Erich Hoyt, Richard Oliver, Jim Darling, John Ford, Kyusoku Iwamoto (cartoonist), Hutoushiki Ueki (science writer), Nobuyuki Miyazaki (head chief of the Atmosphere and Ocean Research Institute of The University of Tokyo), Nobuaki Mochizuki (one of the world's first whale photographers to record a North Pacific right whale underwater in 1990 in Bonin Islands), and Junko Sakuma (freelancer). During this time until before the group reach the destination, the Ministry of Agriculture, Forestry and Fisheries (Japan) and other groups and anonymous individuals watched the group's movements and tried to pressure them not to conduct the tour. Prior to this movement, those who claimed conserving marine mammals including pinnipeds, or individuals who tried to correct illegal and over-extensive hunts (including C. W. Nicol, who was a sympathizer with Japan's whaling industries) or domestic media that have done reporting assignments  in Japan had been discriminated. These include a former fisherman who was ostracized from the community, later to become a whale-watching operator. Several other tours have been operated by former whalers or dolphin hunters in places such as Abashiri and Muroto. Upon the resumption of whaling in Iceland in August 2003, pro-whaling groups, such as fishermen who argue that increased stocks of whales deplete fish populations, suggested that sustainable whaling and whale watching could live side-by-side. Whale watching lobbyists, such as Húsavík Whale Museum curator Asbjorn Bjorgvinsson, counter that the most inquisitive whales, which approach boats very closely and provide much of the entertainment on whale-watching trips, will be the first to be taken. Pro-whaling organisations such as the High North Alliance on the other hand, claim that some whale-watching companies in Iceland are surviving only because they receive funding from anti-whaling organizations. ^ a b c d e f g Hoyt, E. 2009. Whale watching. In Encyclopedia of Marine Mammals, 2nd Edition (Perrin, W.F., B. Würsig and J.G.M. Thewissen, eds.) Academic Press, San Diego, CA., pp1219-1223. ^ Carwardine, M. 1995. Natural Classic, BBC Wildlife, July, p79. ^ a b c d e f g h i j Hoyt, E. 2001. Whale Watching 2001: Worldwide Tourism Numbers, Expenditures, and Expanding Socioeconomic Benefits. International Fund for Animal Welfare, Yarmouth Port, MA, USA, pp. 1-157. ^ "Whale Watching Worldwide". IFAW – International Fund for Animal Welfare. Retrieved 14 May 2015. ^ "Uruguay Becomes a "Sanctuary for Whales and Dolphins" · Global Voices". Global Voices. 2013-12-16. Retrieved 2016-07-11. ^ "5 of the best places to whale-watch in Uruguay". 2015-06-04. Retrieved 2016-07-11. ^ "Descubriendo Uruguay – Montevideo Portal". www.descubriendouruguay.com. Retrieved 2016-07-11. ^ a b Ross, Barbara (30 January 2011). "Whales return to New York City: Massive mammals appearing again in seas near city; draws sightseers". Daily News. New York. ^ "Whale Watching in Virginia Beach brings giant thrills". Retrieved 14 May 2015. ^ "The Pacific". Colombia Travel. Retrieved 14 May 2015. ^ "Killer Whales in Victoria, British Columbia". ^ "Oregon Parks & Recreation Dept. : Whale Watching Center". ^ "Whale Watching in the Northeast Pacific: California Coast". 2SeeWhales. Retrieved 24 August 2015. ^ Kramer, Jennifer (2017-06-01). "Best Baja Whale Watching". Moon Travel Books. Retrieved 2018-11-23. ^ IVANOVA, ANTONINA, EKATERINE RAMÍREZ, ANGELICA MONTAÑO & RODRIGO SERRANO (2018). "ALTERNATIVE TOURISM IN THE BIOSPHERE RESERVE OF VIZCAINO (REBIVI), MEXICO: FACING THE IMPACTS OF CLIMATE CHANGE" (PDF). WIT Transactions on Ecology and The Environment. 227. ^ "Evaluating the sustainability of the gray-whale-watching industry along the pacific coast of North America". ^ Crampton, Vincent (2018-08-03). "Man tripping in Cabo San Lucas". OrlandoSentinel.com. Retrieved 2018-11-23. ^ Sorensen, Gary (2018-10-20). "Have a whale of a time in Maui or Puerto Vallarta". The Spectrum & Daily News. Retrieved 2018-11-23. ^ Paterson, Kent (April 2018). "Whale-watch boom raising hopes in Mexico" (PDF). EcoAméricas. Retrieved 2018-11-23. ^ Quintanar Hinojosa, Beatriz (August 2007). "Oaxaca: jubilo de los sentidos". Guía México Desconocido: Oaxaca. 137: 8. ^ "Sanctuary Ocean Count: Analysis of Humpback Whale Census and Behavior Data 2002–2010" (PDF). 2010-07-01. Retrieved 2017-01-07. ^ "Whale sighting statistics for the island of Hawaiʻi". Lovebigisland. Retrieved 2017-01-07. ^ "WWF-Philippines". Retrieved 14 May 2015. ^ a b c d Guala Catalan, Cesar; Hucke-Gaete, Rodrigo; Ruiz Troemel, Jorge (2011). "Whale-Watching Opportunities in Northern Patagonia, Chile". Pacific News. 35. ^ Zamorano-Abramson, José; Gibbons, Jorge; Capella, Juan (2010). "Diversity and summer distribution of cetaceans in inlet waters of northern Aisén, Chile". Anales Instituto Patagonia. 38 (1): 151–157. doi: 10.4067/S0718-686X2010000100012. Retrieved January 10, 2019. ^ "Whale Spotting". archive.org. 14 September 2014. Retrieved 6 April 2018. ^ "Tourism Tasmania :: Whales & Dolphins". tourismtasmania.com.au. Retrieved 6 April 2018. ^ "Where to see whales and dolphins in the wild". Department of the Environment, Water, Heritage and the Arts. Commonwealth of Australia. 2009-01-12. Archived from the original on January 27, 2014. Retrieved 2010-01-11. ^ "Travelicious Australia – Nelson Bay Hotels". Retrieved 14 May 2015. ^ #. "2015 NSW whale watching season – Wild About Whales – NSW National Parks". Retrieved 14 May 2015. ^ Macfarlane, Zoe (2018-11-20). "Greenland: Capital of cool". NZ Herald. ISSN 1170-0777. Retrieved 2018-12-01. ^ "Five Places to Go in Nuuk, Greenland". Retrieved 2018-12-01. ^ Heide-Jørgensen, Mads Peter (1994). "(PDF) Distribution, exploitation and population status of white whales (Delphinapterus leucas) and narwhals (Monodon monoceros) in West Greenland". ^ "Greenland and the evolving concept of 'Local Community' in relation to its demands for increased large whale quotas". WDC, Whale and Dolphin Conservation. 2012-07-09. Retrieved 2018-12-01. ^ McEnally C. (2014). "After Escaping Whaling Ships, One Whale is Changing Norwegian Attitudes on Whale Meat". The One Green Planet. Retrieved 2015-01-15. ^ "トップページ - イルカ・鯨ウォッチングとフィッシングのKKエルム - 株式会社エルム". Retrieved 14 May 2015. ^ Kyusoku Iwamoto. "僕が出会った世界のクジラ人たち". Retrieved 2015-01-15. ^ "From Dolphin Hunting to Dolphin Watching". BlueVoice.org. Retrieved 2015-01-15. ^ "The Complete Guide To: Whale & dolphin watching". The Independent. Retrieved 2018-12-01. ^ "The world's 50 best wildlife holidays". The Telegraph. Retrieved 2018-12-01. ^ Hoyt, Erich (2006). Whale Watching and Marine Ecotourism in Russia-Туристические экскурсии по наблюдению за китами и морской экотуризм в России. Whale and Dolphin Conservation Society. ISBN 1 901386 56 2. Encyclopedia of Marine Mammals, editors Perrin, Wursig and Thewissen, ISBN 0-12-551340-2. In particular the article Whale watching by Erich Hoyt. Whale watching 2001: Worldwide tourism numbers, expenditures and expanding socioeconomic benefits, Erich Hoyt, ISBN 1-901002-09-8. Whale watching, Discovery Travel Adventures Insight guide. ISBN 1-56331-836-9. The Whale Watcher's Guide: Whale-watching Trips in North America, Patricia Corrigan, ISBN 1-55971-683-5. Whales and Whale Watching in Iceland, Mark Carwardine, ISBN 9979-51-129-X. Wikimedia Commons has media related to Whale watching. Wikivoyage has a travel guide for Whale watching. BBC Newsmagazine, Is whale watching harmful to whales? International Whaling Commission, "to provide proper conservation of whale stocks, making possible the orderly development of the whaling industry"